Impulse Engine Technology is excited to introduce the Impulse Emission Vapouriser muffler a revolutionary new compact pollution control performance muffler that reduces toxic emissions to near ZERO, increases power and reduces noise of OLDER and NEW vehicles from carburetion, fuel injection, gas to diesel. Impulse Emission Vapouriser (EV) muffler uses a row of steel plates positioned inline with the gas flow inside a typical exhaust pipe. As the exhaust gases pass through the EV muffler they heat up the steel plates to 600-800°C (1100-1500°F). 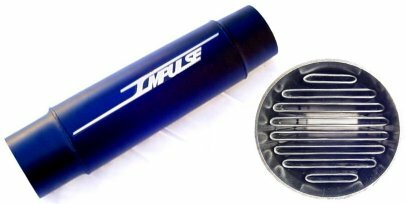 This produces such a high temperature inside the EV muffler it, 1) vapourises the toxic emissions as they pass between the plates which reduce toxic emissions to near ZERO and 2) increases the gas speed which produces more vacuum and improves power and fuel mileage. Also, by having the row of steel plates spaced close together and positioned within the gas flow it, 1) reduces the amplitude of the sound waves which reduce noise and 2) allows the exhaust gases to heat up the plates almost immediately which substantially reduce cold start emissions. The Impulse EV muffler is a very effective low cost pollution control device that has the potential to immediately solve the global air pollution problem produced by motor vehicles and industry and at the same time improve power, fuel mileage and noise.